From the highlands of Serra da Estrela w headed north-west towards the vineyards of the Duoro Valley from which the grapes that make port are picked. I’m supposed to be on holiday but, as the narrow road twists and turns down a steep hillside, with vineyards on both sides, I see a case study in how humans alter rivers and their catchments to suit their needs. I wonder if the passengers on the cruise ships that move sedately through this beautiful landscape have any idea of just how difficult this same journey would have been just fifty years ago. Now there are 51 large dams within the watershed, regulating the flow and, at the same time, generating much-needed hydroelectricity. Before these were in place, the only way to get the port from the quintas in the Alto Duoro to Porto was to load the barrels onto a “barco rabelo”, and then to plot a perilous path through the rapids before using a combination of sail, oars and oxen to make the slow journey back upstream (you can see videos of these journeys on YouTube). 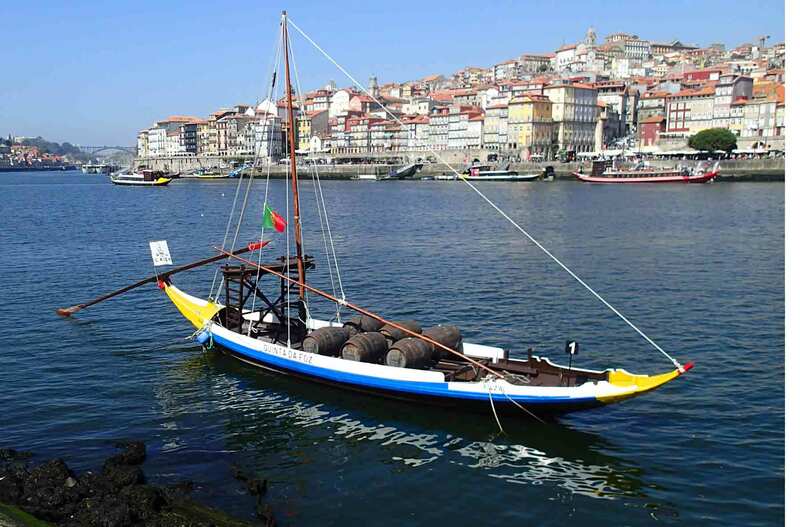 A replica of a barco rabelo moored in the Rio Duoro at Porto, September 2018. The Rio Douro is a type of river that is rare in the UK but very common throughout the rest of Europe in that it crosses (and, for part of its course, forms) national boundaries. There are a few rivers in Ireland which straddle borders (the Foyle is one, and some of the headwaters of the Shannon can be found in County Fermanagh) but, mostly, this is a complication that our river managers do not have to face. 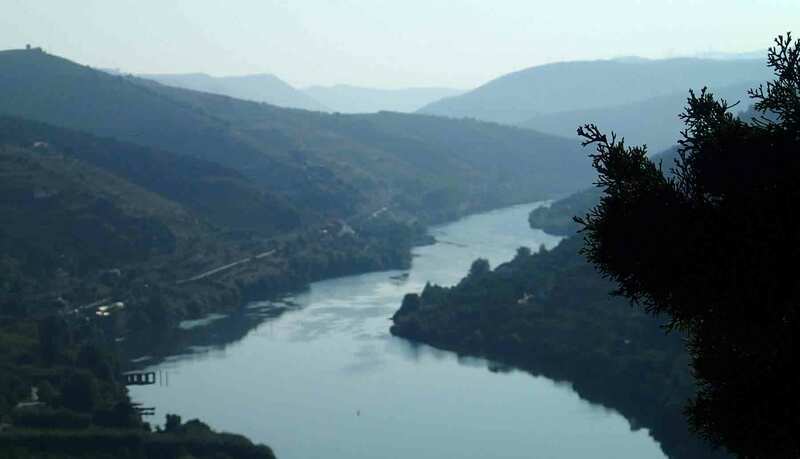 By contrast, eighty per cent of the Rio Douro’s catchment lies in Spain (where it is called the Duero) and it is actually the largest watershed on the Iberian Peninsula. The whole European project, and its environmental policy in particular, makes so much more sense when you are looking at a well-travelled river. Our immediate objective was the Quinta do Bomfin at Pinhão, which produces grapes for Cockburns’, Dow’s and Taylor’s ports. However, after a morning walking through the vineyards and following a tour of the winery (the robot that has replaced human grape treaders has, we learned, been carefully calibrated to match the pressure that a human foot exerts, lest the grape seeds are crushed, imparting bitterness to the resulting wine) plus some port tasting, the lure of the river was too strong. A view across the Douro Valley from Quinta do Bomfin at Pinhão. This, and the previous two photographs, were taken by Heather Kelly. The river bank at Pinhão is lined with rip rap (loose stones) enclosed in mesh cages to protect it from erosion from the waves created by the many cruise ships that make their way up the river with tourists. This, along with the floating jetties at which they embark and disembark, meant that it was not easy to get access to the river; however, I eventually found a small slipway close to the point where a small tributary joins. There were a few loose stones with a green film in shallow water that I could just reach, plus some algal mats coating the concrete of the slipway at water level. I managed to get small samples of each to bring back for closer examination, attracting the usual curious stares from passers-by in the process. The mats on the slipway were composed of an alga (technically, a cyanobacterium) that has featured in this blog on several occasions in the past: Phormidium autumnale (see “In which the spirit of Jeremy Clarkson is evoked”). This is the time of year when the Douro is at its lowest so living at this point on the slipway means that it spends a small part of the year exposed to the air, but most of it submerged. Phormidium cf autumnale on a slipway beside the Rio Douro at Pinhão, September 2018. The left hand image shows the mats on the lower part of the slipway; the right hand image shows individual filaments. Scale bar: 20 micrometres (= 1/50th of a millimetre). The stones beside the slipway had a thick greenish film which, when I looked at it under a microscope, turned out to consist largely of bundles of thin cyanobacterial filaments belonging to a relative of Phormidium: Homoeothrix janthina (kindly identified for me by Brian Whitton). 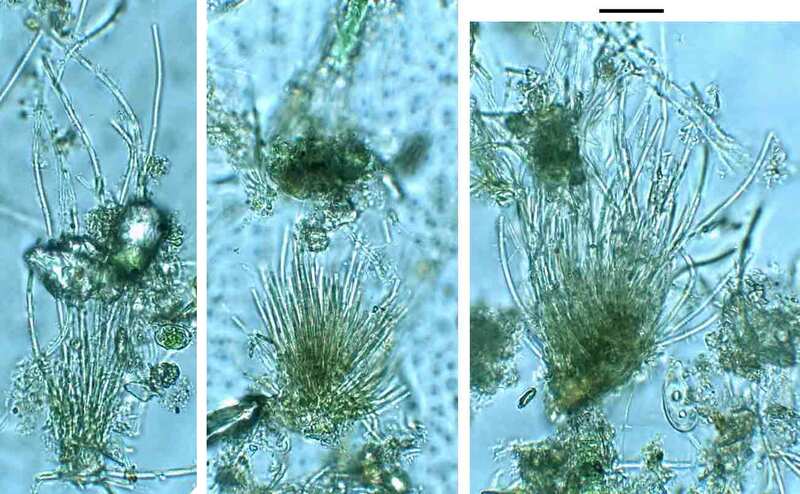 Homoeothrix differs from Phormidium in that the filament are often slightly tapered, rather than straight-sided and usually aggregated into colonies, often growing vertically towards the light rather than intertwined to form mats. It is a genus that I see in the UK (including, sometimes, in the River Wear) but which I have not previously written about on this blog. The photos below show tufts of filaments but it would be quite easy to imagine several of these clumps joined together to form a hemispherical colony, before I disrupted them with my vigorous sampling technique. 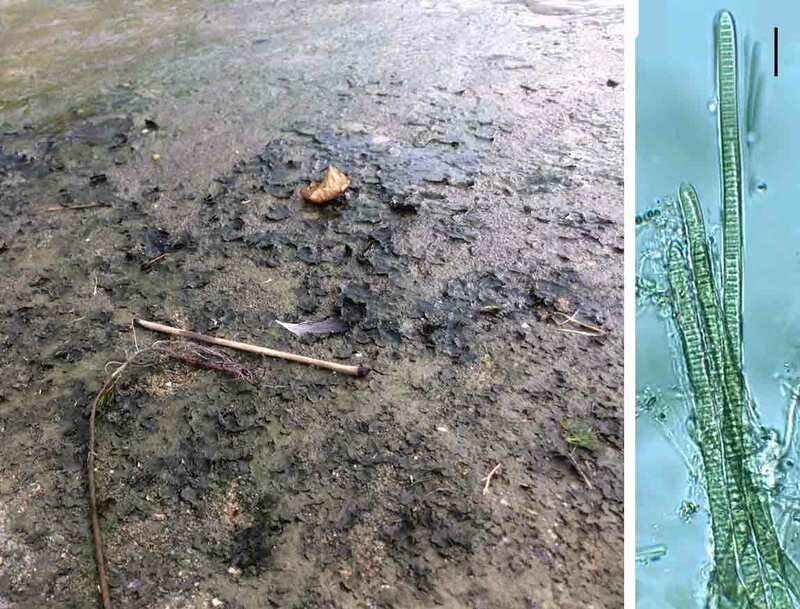 Left: the rip rap at the edge of the Douro at Pinhão from which I sampled algae in September 2018; right: the stone after vigorous brushing with a toothbrush. Bundles of filaments of Homoethrix janthina from the River Douro at Pinhão. Scale bar: 20 micrometres (= 1/50th of a millimetre). Many of my posts try to make the link between the algae that I find in lakes and rivers and physical and human factors in those water bodies and their surroundings. 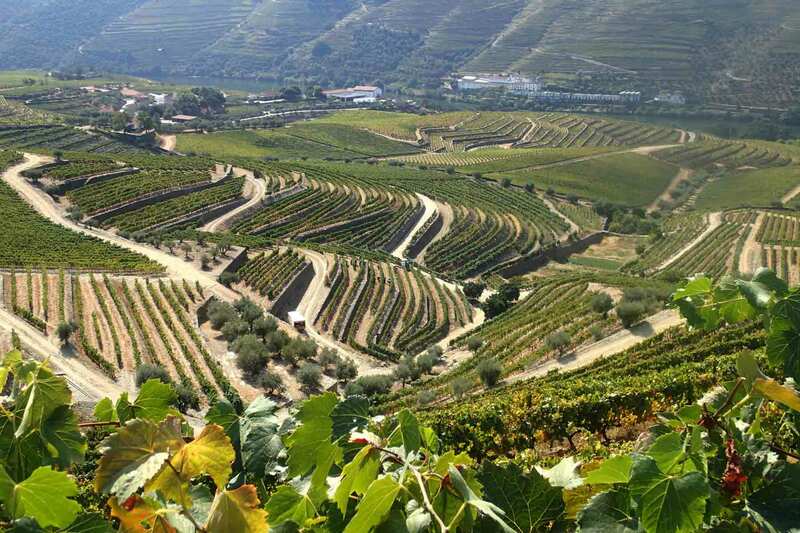 That is not an easy task in a large river basin such as that of the Douro as there is so much more of a hinterland including large towns in Spain such as Valladolid. The river, to some extent, integrates all of these influences and, whereas the vines around Pinhão have their roots in nutrient-poor granite and schist soils, the river’s journey to this point has covered a range of different rock types, including chalky clay soils in the Spanish part of the catchment and the water reflect this. This cocktail of physical alteration and pollution, shaken up with a dash of international relations, recurs in the largest rivers throughout Europe and is either a fascinating challenge for an ecologist or a complete pain in the backside, depending on your point of view. Bordalo, A.A., Teixeira, R. & Wiebe, W.J. (2006). A water quality index applied to an international shared river basin: the case of the Douro River. Environmental Management 38: 910-920. 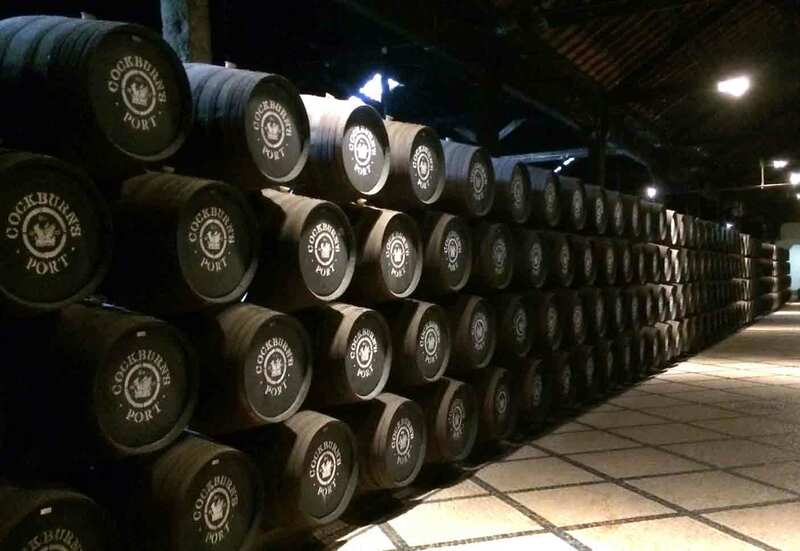 The end of the journey: port maturing in barrels at Cockburn’s lodge in Vila Nova de Gaia.